to the close, and maybe make new highs. Thanks for coming. See you next week. Take a course or two. from back surgery, a sprained right ankle with bone chip, and a sprained left ankle with broken fibula. Stamia is not so good. 11:06 This was a move 5 of 7 in an up Chaos Clamshell. I saw that setup on the MTRainbow chart. 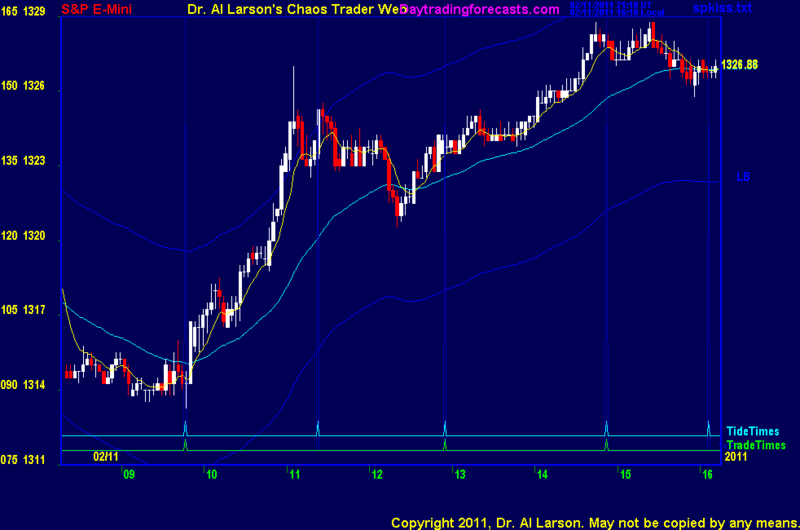 2/11/2011 9:19:04 AM MT Al****:: I said early that the Rainbow chart looked like a 1-2-3-4. 2/11/2011 9:11:19 AM MT RAH:: @ Al again: what was the CC W5 setup on Rainbow? You intrigue me. 2/11/2011 9:08:57 AM MT RAH:: Well done on that trade Al (says the student to the tutor! ), makes up for my day yesterday. Nice Leg 5 of CC, or in Elliott terms, prob W3 of 5. 2/11/2011 9:01:04 AM MT RAH:: Move SL up again? 2/11/2011 8:54:43 AM MT RAH:: one hell of a rally happening 7 or 9 pointer maybe? 2/11/2011 8:54:02 AM MT RAH:: Tnx Al! 2/11/2011 8:30:48 AM MT Al****:: MM: I think I fixed the pivot prices. My @#$% end of day data collector failed. 2/11/2011 8:29:35 AM MT RAH:: @ Al: thats OK Al, I can wait for your answers - maybe at the end of the day, or between trades - or just send me an email later if you remember. Nice trade of yours so far today! I don't think I would have had the guts to take it without you commenting! 2/11/2011 8:17:47 AM MT Al****:: RAH-I can't really answer a lot of questions whyile doing the Chaos Clinic, espeically while making a trade. 2/11/2011 7:51:51 AM MT RAH:: @ Al : How important are the moon flux lines of -T180, +T045, +T225 compared to the planetary flux lines? 2/11/2011 7:45:42 AM MT RAH:: @ Al: wondering why you're calling Raindow 2640 support today? Isn't it just one more EXMA (which happens to be below the chart this morning (sorry, afternoon)? 2/11/2011 7:45:07 AM MT RAH:: Good afternoon all :-). To keep in line w usual salutations here, apparently its 51F outside here, so quite balmy really! 2/11/2011 6:24:44 AM MT EOE:: GM everyone. heat wave coming 14F. ;-) lets hope its not another mm stinker today. good luck.